©2012, R.L. Delight. Life Drawing, 30 minute sketch. Lyra water soluble graphite, water wash on water color paper. 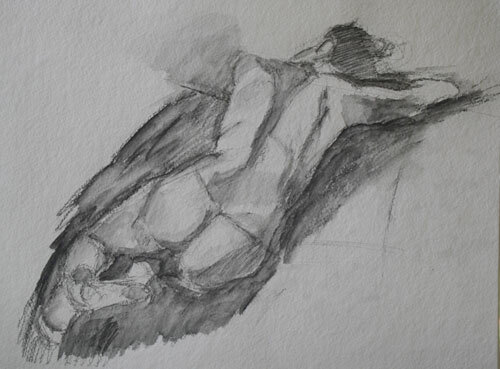 I tried a new-to-me technique at the local life drawing session last Sunday. I picked up some Lyra graphite aquarelle pencils with the idea that it would be fun to be able to use graphite and yet have the ability to produce a water color like effect. Here is my first attempt. I used a Niji water brush on Strathmore Windpower cold pressed water color paper. I wasn't exactly sure if I would like it as water colors never have really appealed to me but I sure had a lot of fun! I am going to keep using it in future life drawing sessions. © 2012, R.L. Delight, Grisaille close up. I had transferred the drawing earlier. It isn't exactly my favorite way of working, making a sketch and then transferring the design, but the instruments are tricky to draw and I could use the practice. 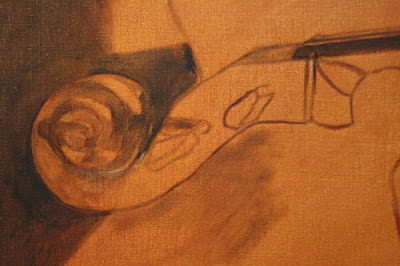 At this point I am correcting the transferred drawing as I am painting the grisaille. I took this picture earlier today and it already looks different. I think I will draw several scroll studies when this painting is finished. It is quite a challenging object to draw! I will share more for the next post. In the meantime, the sun may be coming out and the outdoors calls. Softens the work and I think helps with negative space in a shaowy effect, helping with the painting, i would think,. Think I'II try it. "Softens the work and I think helps with negative space"
Exactly! There is also a bit of a learning curve when using a new art medium but I could see the potential. The paper I used was a bit rougher than I would like too but I think I will use the pad up. I am going to try it again next Sunday. I like it. You know poses look so, posed when you have nothing other than the subject. I like them but I also find them odd. Your eye and brain want to fill in the background to help make sense of the pose. At least mine does. Theresa, you are right about the odd looking poses without the background. I don't often fill in the background during life drawing because I am always trying to get as much info on the figure in before the timer goes off! True long poses allow one to do that, in fact the background is often another tool. That said, I am thinking that your comment gives me a good reminder to get a bit more in, even if it is a line or two. It also has reminded me how much I miss doing long poses. It just hasn't been easy to get that going here but, I do need to. Thanks for the comment!